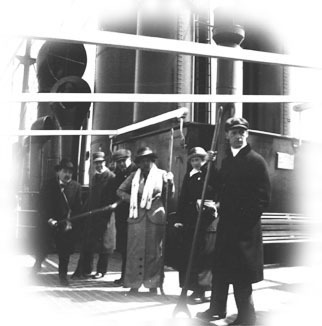 People from Ateneum on a trip to Copenhagen in 1915. Gunnar Finne, Ragni Holmberg and Torsten Stjernschantz. The highest form of education in the field of arts and crafts started in Finland in a peculiar turning point of history, one could even say as a result of disagreement between different lines of action. In the 1860s a total revision of the educational system was in view. A common elementary education, the Finnish Folk School, was established. The church was compelled to release its hold. The guild system was about to come to its end. The latter was the very institution that had been responsible for the training of craftsmen. There had been moves and splendid suggestions for the developing of art education. Professor Fredrik Cygnaeus had worked persistently for the establishing of an Academy. His work failed. His successor, the university professor C.G. Estlander, continued in the same direction. He recommended the uniting of the education of art and industrial design in a common building. He made appeals to the leaders of industry and business as well as to state authorities. Estlander was the one who managed to get the School of Applied Arts, The Veistokoulu, started on January 11, 1871. The beginning was modest in all respects. There had been the famine years in the 1860s. Those years gave new aspects to the use of common money. Accordingly even art had to be harnessed to improve the state of the whole nation. The esthetic level of industrial products had to be raised, and new markets had to be found for them. Art for art's sake was not to think of at the time. When the School of Applied Arts was opened in the Kasarmikatu elementary school building, almost half of the courses consisted of all-round practical education. Among the subjects taught, eleven in all, were line and free-hand drawing, and stick/brick drawing; ornament drawing; moulding ; house and decorative painting; all-round natural science; book-keeping and arithmetics. Lessons were given in work-day evenings and on Sundays before noon. The number of students was 64 by the end of the first term. In the autumn term of 1871 some women entered this male seat of learning. Drawing and painting had naturally been included in the normal education of young girls of the higher social classes even before. But now women started to find their way to the applied arts. The Finnish system was very progressive. This progressiveness was, however, almost 'indecental', a threat to tradition. Higher education and the keys to creativity were so far reserved for men. It is worth noting that the Central School of Applied Arts, as it was renamed by a gracious decree of 1885, almost from the start also was a seat of learning for women, even though many social norms mined their way to professional achievements in many respects. 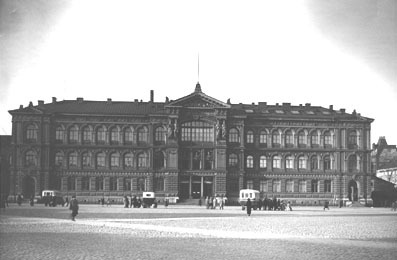 The Central School of Applied Arts had gained a new, important role by the middle of the 1880s, and when a new building called 'Ateneum' was inaugurated in 1887, a splendid possibility to develop the higher education in arts and crafts had been created. The Finnish Society of Crafts and Design, constituted in 1875, could now forward education in rooms that seemed to signal a bright future. The Central School of Applied Arts combined with an art museum was given the name Ateneum. The building still carries the Latin motto 'CONCORDIA RES PARVAE CRESCUNT' (Small things thrive of concord) on its facade. 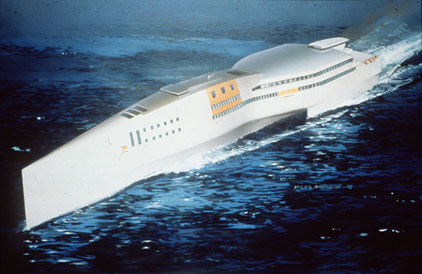 The same amount of money had been spent as for the present Opera House in Helsinki. The opponents of the building called it 'the Palace of Millions'. Especially the piling had cost both time and money. Nevertheless, the Central School of Applied Arts strove on. As a result of the purposeful work of its director Ernst Nordström, new goals were set in the mid 1890s. There had to be several years long set courses in the most popular professional subjects. The courses of the Central School had to be lengthened to three years. As an entrance requirement the students had to have passed at least elementary school (the Folk School) or have acquired equivalent knowledge. And the proportion of art subjects had to be further increased. Subjects not pertaining to the line of the school, such as elementary mathematics and orthography, were gradually excluded. Practical problems also lay behind this: The number of students grew quickly and the first signs of lack of space appeared. Reforms were speeded up by the new art director Armas Lindgren. The new century meant a radical change to the education in applied arts. New vitality had to be found and the educational quality improved. Development was also made faster by the growing amount of international exchange. A.W. Finch, of Anglo-Belgian origin, had settled in Finland in 1897, and he started a determined development of the teaching of ceramics in the Central School of Applied Arts. He and hissuccessor, Elsa Elenius, raised the training in ceramics and Finnish ceramic art to an international level. The task of the Central School was 'partly to offer persons who have worked in practice with art crafts an opportunity to gain greater artistic competence in their professional education, partly to distribute general knowledge and skills to artistically talented persons'. The Central School of Applied Arts was gradually divided into four sections, a senior school of applied arts, a senior craftsmen's school, a preparatory school, and besides a course for art teachers. Birger Kaipiainen. The Birds. Exercise work 1934. At the end of the spring term of 1912 Armas Lindgren resigned from the director's office and was succeeded by Rafael Blomstedt. Werner von Essen was appointed as headmaster in 1915. A new curriculum was also adopted in the same year. The education was divided into set courses and obligatory subjects along the different crafts. The senior school of applied arts was extended to three years including the following departments: model drawing, furniture drawing, decorative painting, ornamental carpentry, ceramics, forging and metalwork, and teacher training. The department of graphic art started in 1926, and in the school year 1929-1930 the department of textile art was established. 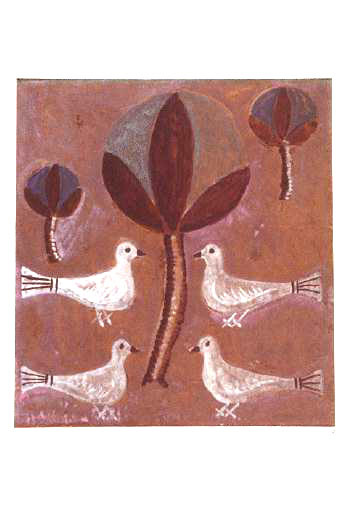 Textile pattern design had even before this been taught in the Central School, but with the start of a separate department of textile art, proper training and teaching in design of woven fabrics was begun under the leadership of Hulda Potila. She had a central position as part-time vocational teacher in the textile department 1928-1948 and later made a remarkable career as senior teacher of textile art during the years 1949-1962. It was at the Department of Textile Art that one of the first doctor's degrees of art was taken at the University of Art and Design by the textile artist Päikki Priha. Her thesis treats ecclesiastical textiles. 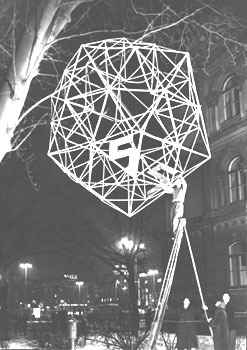 'Himmeli' (A himmeli is a Finnish traditional decoration built of straw pieces on strings and hung from the ceiling) made under the leadership of Ilmari Tapiovaara, 1954-55. ©Photograph: Kaarlo Kultala. UIAH/Picture Archives. In 1943 Werner von Essen retired with a pension and Rafael Blomstedt became headmaster. Arttu Brummer-Korvenkontio was appointed as art director. The constitution of the school was confirmed by the Ministry of Commerce and Industry in September 1949 and the name of it changed to THE INSTITUTE OF INDUSTRIAL ART. The institute was divided into the Institute of Applied Arts and the Vocational School of Arts and Crafts. The school was still administrated by the Society of Crafts and Design. Functionalism was mixed in with the design ideology, maybe even more than formerly was the case with the Bauhaus Ideology, and once again more international impulses. The search was for solutions of deliberately plain, timeless and clean forms. 'Only the simple is best, leave out all the unnecessary, develop plasticity' was the aim of Ilmari Tapiovaara, senior teacher of the Interior Decoration Department of the institute. He was senior teacher in the beginning of the 1950s and later on teacher during the period 1979-1986. In the year 1951 Tapio Wirkkala was appointed as art director of the Institute of Industrial Art and Bruno Tuukkanen headmaster. In 1960 the architect Markus Visanti started as headmaster, and in the autumn of the same year the institute lengthened the education to fours years. 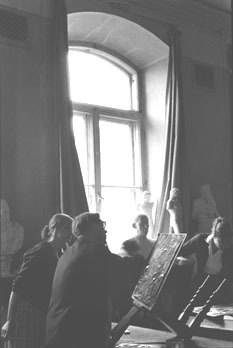 At the same time artistic leadership was offered Kaj Franck, who continued the line of reforms, especially the education plan of general design. In July 1965 the State took over ownership of the school. The institute continued to work in two units: The Institute of Industrial Design and the Vocational School of Arts and Crafts. The former was run as a four year day school. It was divided into the departments of graphic art, camera art, ceramic art, metal art, garment design, interior decoration, textile art and art teacher training. To some of the departments entrance requirements included completion of secondary school, to other departments completion of the middle school (the lower forms of secondary school) and besides at least 18 years of age. The aim of the Vocational School of Arts and Crafts was to give persons who intended to work or already were active as workers and work leaders in the industrial art vocations, education in both theory and practice. Special courses were also arranged. The vocational school worked as a three year evening school. It was divided into a general line including a course in graphics and one in interior consulting; the line of book-printing included the setting, printing, and bookbinding schools; the photographic line included the photography, film-photography and television photography schools. Studio of the Camera Art Department 1965-66. 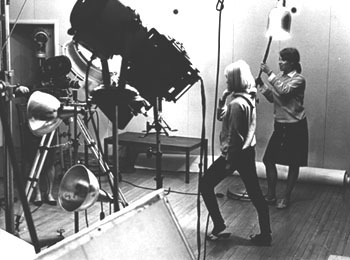 From left: Tuula Pöyry filming, Tiiti Taskinen acting and Irma Rauhala lighting up. The architect Juhani Pallasmaa was headmaster during 1970-1971, and from the beginning of 1972 the architect Jouko Koskinen took over. In the curriculum there had been a transfer to a system with achievement points and the set yearly courses had been abandoned. In 1973 there a new law was drafted for the University of Industrial Arts, and on July 1, 1973 the Institute of Industrial Arts and Crafts became the University of Industrial Arts. The construction of the new university was based on a division into institutions: the institution of art teacher training, the institution of visual communication (graphic planning, photography, stage design, film and television work), the institution of product and environment planning (ceramic design, textile design, garment design, interior decoration, industrial design), and the institution of general education. The Vocational School of Arts and Crafts was reshaped into a educational centre. By the end of the first academic year there were 419 students at the university and 373 in the training centre. The number of full-time teachers was 47. In 1978 a statute was enacted to make it possible to take higher degrees in the field of industrial design: a Master of Arts Degree in Applied Arts was carried into force. Yrjö Kukkapuro was appointed as headmaster in 1979, and after him in 1981 the interior architect Torsten Laakso. 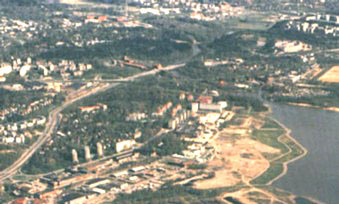 The university now began to grow into its full size in the 1980s. In 1981 it became possible to take a Licentiate and a couple of years later a Doctorate of Arts. The university moved from Ateneum to Teollisuuskatu 19 in 1982. The joint plan of the universities of art for location in Pasila had stranded. During the second half of the 1980s remarkable and deep reforms were initiated. The difficult question of space could finally be solved. Moving to Arabia in 1986 greatly improved the conditions of work for the university. New coherent accommodations made it possible to raise both the level and volume of education in art and design. The interior architect Yrjö Sotamaa, who had been appointed as headmaster in 1986, put the highest international level as a goal for the university. Conditions in the university were developed powerfully. Many new lines of education were established and local design centres opened in Vaasa and Kuopio. In 1991 the Institute of Design Leadership, DMI, was established and an international training programme of Design Leadership started. The same year the first doctors of art also defended their doctoral theses. The first conferment of degrees at the University of Art and Design was arranged in June 1993. A programme of education in digital visualization and planning, started in 1992, resulted in the establishing of a new unit, the Media Laboratory, in the year 1993. Other special units are at the present the Education Centre, the library and MUOVA in Vaasa. The number of students has grown continuously: in the mid 1990s it is approaching the 1,500 line. Some 10 per cent of the students come from abroad. 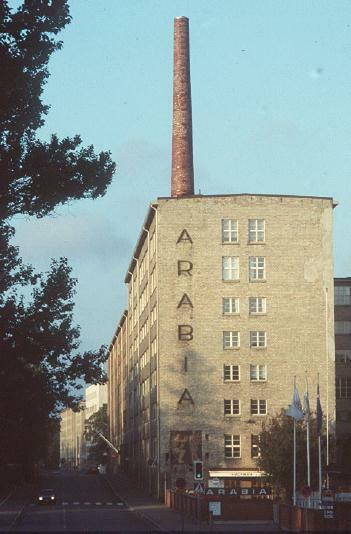 A plan for an industrial arts centre on the Arabia Shore (Arabianranta), initiated in the middle of the 1990s, has proceeded well. 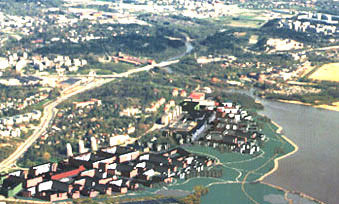 In August 1995 an intentional agreement was signed for creating a centre of industrial art in the part of town called Toukola by the year 2000. Parties of the agreement are: the Ministry of Commerce and Industry, Eläke-Varma, Hackman, Metra, the University of Art and Design, the Pop/Jazz Conservatory, and the City of Helsinki. Janne Andersson and Marko Kolu. Final Exams work, 1995. As a result of more than a century of development a many-sided, capable university has been born. The painful and partly also speedy phases of the 1970s evened out in the next decade. The final move from Ateneum through the city part of Vallila to Toukola gave a new pace to the development - in spite of distrust. Relations with the state authorities have grown in a positive manner, the conomic life trusts the University. Even though many hard saving measures have to be taken due to the depression, results are made in the central fields of knowledge and education, both quantitatively and qualitatively. The University has grown into its full size - to a noteworthy university of art and design both nationally and internationally. University of Industrial Arts Helsinki, UIAH. 1996.